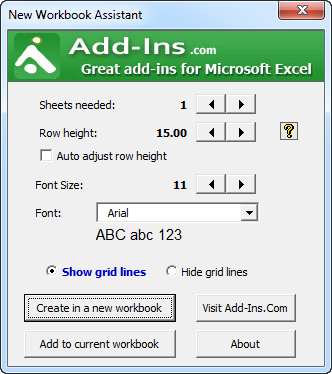 The default font for new workbooks in Excel 2007-2019 resulted in a loss of 15% of our data rows we could see on the screen. Just set the options you want, and click "Create a new workbook. If you use a font size of 10 and a row height of 12.75 (or auto adjust), then you will have 15% more rows in Excel 2007-2019. Download Now - the New Workbook Assistant is free - no purchase required. Does not expire. No nag screens.